Let’s get the opposition out of the way first. Laois were absolutely abject. They came into this with the benefit of a morale-boosting win over Longford. Four goals to their name. And another in less than a minute to put the wind up Kildare here. It was set up for them. Laois don’t fear Kildare. Never have. Call it confidence. Arrogance perhaps. But Laois expect to beat their neighbours from up the M7. They’ve done it often enough over the years. Kildare are “windy”, nervy. Wilting Lilies. But that attitude ignores the evidence of the last decade. Laois have not beaten the Lilies now in 5 championship attempts since lowering their colours in the 2005 semi-final. One draw two years ago and four defeats by an average margin of over 14 points. The tide has turned. So today must be taken in context. Laois truly looked Division Four. 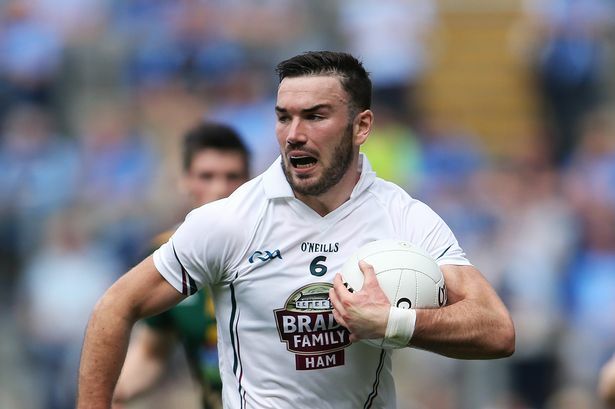 Kildare are heading to Division One, their curve undoubtedly upward under the cerebral management of Cian O’Neill. Kildare were impressive though. So much stronger, confident and together than 12 months ago when they met Wexford in that abomination of a quarter final in Croke Park. A team growing up. Performances like this were sign-posted four years ago when the majority of today’s starting line-up propelled the Whites to a Leinster under-21 title having been unlucky to run into a Longford booby-trap at minor level three years earlier. They beat Laois by 24 points en route to that title so perhaps today’s bunch have a different view of the O’Moore County than some of their predecessors. Kildare took their time to get over the early shock of Donie Kingston’s goal, but their dominance after the first 20 minutes was absolute. Their power and pace relentless, all their subs determined to make a telling impact. Captain Eoin Doyle was still remonstrating with a colleague for a perceived mis-demeanor with the game entering injury time. Thirteen different players scored for the winners, equaling a championship record for the county they’d set against Louth in 2013. Some had questioned where the scores were coming from with corner forwards Neil Flynn and Ben McCormack on the injured list. Laois had four scorers in stark contrast and failed to score from play from that 1st minute goal until Alan Farrell’s point 48 minutes later. Kildare were on their game from 1 to 15, without even mentioning the impactful bench. They didn’t even need to call on Paddy Brophy, only back on the panel a few short weeks after calling short his stint in the AFL. Perhaps that was a little message from O’Neill. No one breaks into this group easily. He’ll get there but he’ll need to earn it. It didn’t look so promising in the first minute. Mick O’Grady had been selected to reprise his man-marking job on Donie Kingston from the replay two years ago at the same venue. But when Ollie Lyons mis-placed a pass on his first of many breaks out of defence, the big no.14 was at the end of a Laois attack and shrugged off O’Grady, David Hyland and Johnny Byrne with casual ease before slotting home past Mark Donnellan. It took Kildare a while to get over that shock. But they never looked like panicking. The defence learned its lesson quickly and impressively. Despite Laois more than breaking even at midfield in the opening quarter and with Doyle’s dropping deep allowing John O’Loughlin to race head-down into the danger zone a bit too often for my liking, there was no end product for the O’Moore men. Too often Laois ran into a wall of Kildare defenders. The half-back line’s execution of strong but lawful tackling was a cut above anything we have seen from that trio, with Keith Cribbin in particular showing a side to his game that was more than welcome. The elder Johnstownbridge brother was outstanding all day, as was the bullocking Johnny Byrne on the other wing. Kildare had pace and power to burn and gradually they found a way into the game. Clubmates and housemates Daniel Flynn and Cathal McNally were much to the fore as Kildare’s forward division creaked into some sort of fluidity. McNally, a marmite figure for the supporters and perhaps not a unanimous choice in the corner, fully justified his selection. Kevin Feely, landed a 2nd minute free from a central position to get Kildare off the mark in the 2nd minute and with McNally landing two from play and ‘keeper Mark Donnellan dissecting the posts from a ’45, the Lilies were ahead by the 6th minute. But it was still even enough and Kildare spluttered for the next 14 scoreless minutes. Big Donie landed a free for Laois to level it but Flynn, a powerful menace at full forward all afternoon, and particularly in the second quarter, drove over to put Kildare back ahead on 20 minutes, 0-5 to 1-1. Evan O’Carroll, frustratingly inconsistent for Laois, managed their last score of the first half on 22 minutes but Kildare effectively secured the match from there to half-time with seven unanswered points. Lyons, who seems to have an extra spring in his step this year, wriggled forward once more. While his instinct is always to find a better qualified forward to apply the finish, in the 23rd minute he ran out of such options and had to swing one over for himself. Flynn then powered two more over as Kildare went into overdrive, the second a stirring signal of intent as he shouldered a Denis Booth to the ground before splitting the posts off the outside of his boot from wide on the left. Tommy Moolick, Keith Cribbin, Niall Kelly and the hard-working Paul Cribbin completed the scoring in the first half as Kildare moved seven points clear. Half-Time: Kildare 0-12 Laois 1-2. The Lilies had benefitted from a fresh wind but Laois frankly looked beaten as they trooped off at the break. The midlanders had played conservatively against that breeze in the opening period and you expected a change of approach with the elements behind them and a mountain to climb. Disappointingly for their supporters however, it was more of the same in the second half as they sat back rather than pushing up and trying to bring their forwards into play. A few high balls ballooned into Kingston but he was superby marshalled by O’Grady with the composed Donnellan also dominant in the air whenever Laois opted for altitude. Laois needed a fast start after the break but it was championship debutant David Slattery who stretched the Kildare lead with a fisted point. Slattery had struggled to make the ball stick in the first period but became increasingly involved after the break. Another Kingston free got Laois off the mark but 1-3 in five minutes from the 43rd minute onwards put the game well and truly to bed. Byrne surged forward once more to kick a point and the economical Kelly found the range with two more before Slattery’s perseverance set up Flynn to side-step Colm Begley and Brody to power home Kildare’s goal with his left foot and stretch their lead to twelve points (1-16 to 1-4) with 22 minutes still to play. Laois fans streamed out the gates. Their players’ heads were down the road to Portarlington already at that stage you felt. Gary Walsh added some purpose to the Laois attack when introduced, adding three points to their tally. But that was all they had. Kildare’s play scarcely suffered with the introduction of their subs. Fergal Conway was the first starter to make way on 53 minutes and the rest was just reward for another outstanding performance of the Celbridge wing-forward, despite him failing to trouble the scoreboard. McNally notched his third point before making way for Chris Healy, with Feely (free) and substitutes Fionn Dowling and veteran Eamon Callaghan completing the scoring for the Kildaremen. One disappointment for O’Neill may be the absence of goal chances. Other than Flynn’s green flag, Kildare’s best chance of a major was squandered when Dowling’s effort was saved by Brody when perhaps a cuter forward would have spotted Kelly free in front of goal. Kelly himself might have gone for goal when taking one of his second-half points. But that’s nit-picking. You can denigrate the opposition and everything needs to be considered in that context. But Kildare were nonetheless hugely impressive from 1 to 20. Meath in 13 days time is an undoubted step-up in class as you would expect in a Leinster semi-final. But it’s good to see the two traditional rivals of Dublin seemingly getting their acts together. Mark Donnellan – 7 – confident under high ball, intelligently choosing when to punch and when to catch. Under very little pressure from kick-outs as Laois sat back. David Hyland – 8 – had Kingston junior in his back pocket and usual penetrating runs forward. Mick O’Grady – 7 – solid on Kingston senior after rocky opening minute. Went off with a minor injury. Ollie Lyons – 8 – like O’Grady recovered superbly from mis-placed pass that contributed to goal. So hard to stop when he comes forward. Jonathan Byrne – 8 – Huge performance. Solid in the tackle and barrelled forward to great effect. Took point well. Eoin Doyle – 8 – Leader. Great cover for the full back line. Ferocious in the tackle. Keith Cribbin – 8 – Best defensive display for Kildare. Duracell bunny. Kevin Feely – 8 – Another big display from the Athy man. Couple of big marks in second quarter swung midfield battle. Not as hot on the frees as normal. A minor concern with Neil Flynn injured. Tommy Moolick – 7 – A typical Tommy Moo performance. Hard-working and took his point as usual. Fergal Conway – 8 – contender for man of the match despite not being one of the 13 scorers. Most improved player in last 12 months. Niall Kelly – 7 – played within himself at times but still weighed in with three classy points. Paul Cribbin – 8 – another athletic and hard-working performer, putting disappointing league final behind him. David Slattery – 6 – on a lot of ball in second half after first half to forget. Speedy. Daniel Flynn – 9 – raw power, pace and finishing ability. Man of the match. Shoulder and point in first half set the tone. Cathal McNally – 8 – big first half in particular. Important outlet and took three points well, despite a couple of misses. (Subs on too late to be fairly rated). Subs: Eamon Callaghan 0-1 (for Conway 53), Chris Healy (for McNally 57), Fionn Dowling 0-1 (for Moolick 57), Emmet Bolton (for Flynn 65), Peter Kelly (for O’Grady 65). Subs: Ambrose Doran (for Donoher 19), Gary Walsh 0-3 (1 ’45) (for O’Carroll), Ross Munnelly (for P.Kinsgton 52), David Conway (for Doran 65), Kevin Meaney (for Quigley 65), James Finn (for Kelly 66).